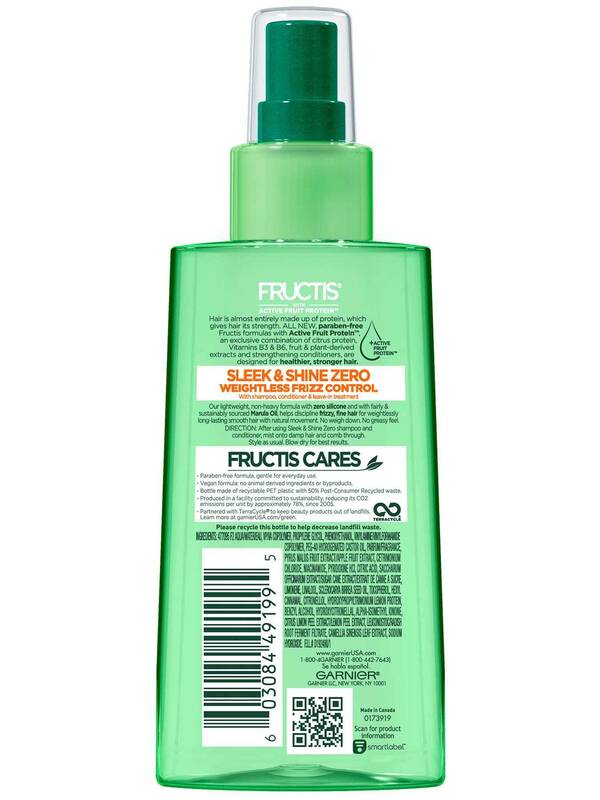 Lightweight, non-heavy Fructis Sleek & Shine Zero Smoothing Light Spray with zero silicone and with fairly & sustainably sourced Marula Oil, helps discipline frizzy, fine hair for weightlessly long-lasting smooth hair with natural movement. No weigh down. No greasy feel. After using Sleek & Shine Zero shampoo and conditioner, mist onto damp hair and comb through. Style as usual. Blow dry for best results. Pressed from the nut of South Africa's Marula Nut Tree, Marula Oil is a source of essential fatty acids Omega 6 and 9 which hydrate dry hair and skin. Everything you need to complete your Sleek & Shine Zero hair care routine. Rated 5 out of 5 by Irish angel from Amazing but....... I love this product. It made my frizz tammed even my boyfriend notice. But it also seek to man my hair feel an almosy seem thicker. But I did feel sticky at frist but as soon as I dried it wash anymore. The only think I hated wasn I mad m hair feel dry no soft, but it surely did help tame frizz an tangels. Rated 5 out of 5 by Jill06 from Amazing for fine waves and curls I've been purchasing and using this light spray for 6 months now and it is my favorite product! I have fine hair, loose curls and like to wash my hair at night, spray Sleek & Shine Zero, and let it dry over night. My curls look amazing come morning and are flexible enough to style and touch. It really helps to define my curls, keep my hair looking clean and fight frizz. Most other products either weigh my hair down or cause more frizz. Before I go out I need to use hairspray to help curls hold their shape all day. Rated 5 out of 5 by Lucy1224 from Love this!! I just recently starting using this product and I absolutely love it. My hair is extremely frizzy and I've tried so many different products but they all make my hair look soon greasy. This product doesn't. Rated 5 out of 5 by chugsmommy11 from Frizz control that doesn't make you oily! 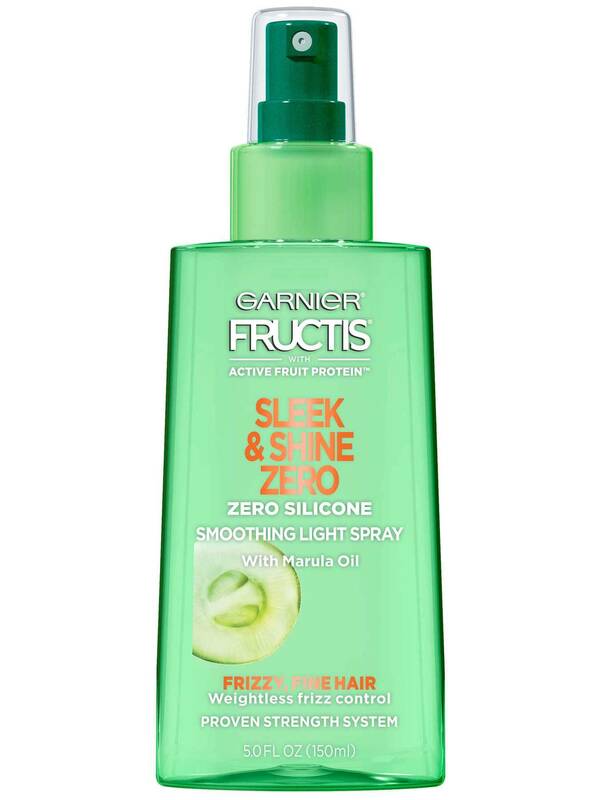 Garnier Fructis' Sleek & Shine Zero Smoothing Light Spray is an amazing addition to the Garnier Fructis line. Made with Marula Oil, this spray does not leave your hair oily like Argan Oil sometimes does. I use it in conjunction with the Sleek & Shine Zero Shampoo and Conditioner, and a sea salt spray which gives my dry hair some texture. I've definitely noticed sleeker hair without my usual frizzy curls. Impressively, the frizz stayed managed even going a few days between washes Very little of this Smoothing Light Spray is needed to do its job. After 4 weeks of use, nearly my whole bottle is intact. I'm very pleased with this new addition to Garnier Fructis' line and will continue to be a purchaser of this product! With information found straight from the label, the spray in this 5 fl. oz. bottle is silicone free and paraben free, with no animal derived ingredients or byproducts. It is a vegan formula and the bottle itself is made of recyclable PET plastic with 50% Post-Consumer Recycled Waste. Garnier Fructis is partnered with TerraCycle "to keep beauty products out of landfills". Not only is Garnier Fructis doing great things for haircare, but they're also environmentally conscious. It's a win for everyone! Rated 4 out of 5 by Mgogu07 from Nice spray for thin hair. I gave this product only four stars because it's a little tricky to use but it does work great. I used it along with the shampoo and conditioner. I had to play with the amount I was spraying on my hair a few times. A little goes a long way! If you spray too much it will get your hair a little stiff and you can feel a residue in it the next day, so be reserved when spraying. I only use a couple of sprays, 2-3 and distribute with a comb. If you use it right you'll love it! Rated 4 out of 5 by Butterflykhg from Love this Spray! 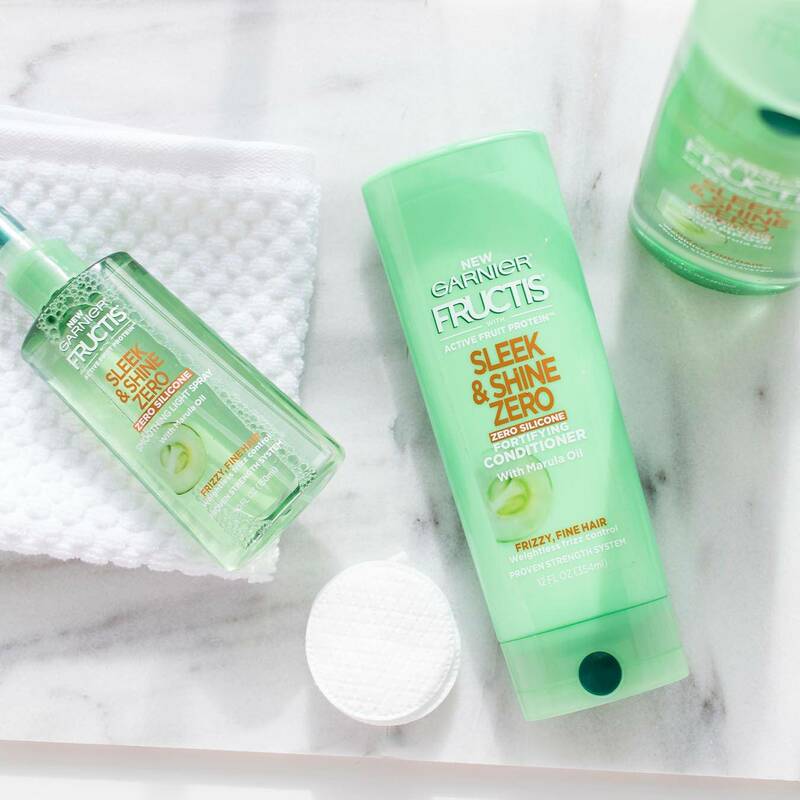 The new Garnier FRUCTIS Sleek & Shine zero is a light smoothing spray. It makes my hair so shiny, and it has been so dry lately because of the cold weather. It has a very fresh smell and doesn't make your hair oily. I have been trying to buy Paraben free products since they are better for you, and this spray is paraben free! I would definitely recommend this for all hair types. Rated 5 out of 5 by amjewett from Works great! I have very curly thick hair. A common problem with curly hair is uncontrollable frizz. I used all three products together and noticed a difference as soon as I used it! Curly hair is very finicky, and this seemed to help me have better hair days! I would highly recommend this to friends and family! Rated 4 out of 5 by krystull from Smoothing Light Sprat I used the smoothing light spray for a 3 week time frame. I used it with and without the shampoo and conditioner. I'm a frequent hair dryer with blow dryer method type of person and I use a hair straightener. The smoothing light spray works best when sprayed in hands and then ran through wet hair. Not just sprayed directly on the hair. Even when sprayed directly on wet hair. It left my hair feeling like I had used a gel or something. My hair would feel stiff in the areas I sprayed directly. I liked the result better when I sprayed in my hands just 4-5 times, then ran my hands through my hair.